Radsters are an active bunch, but they have a big problem: water bottles. Way Cool Arena has been turned into a bottle dump, and the beloved skate park is next! The kids and Slider must find a way to get rid of the heaps of empties and reduce future waste while making sure Radsters stay healthy. For Real segment: While visiting his friend at the Fashion Institute of Technology, Harry learns about sustainability, like recycling fabrics in clothes to reducing plastic waste by using reusable water bottles. Drinking water regularly is essential, but how you drink it is also important. Make choices that are healthy for both your body and the environment. 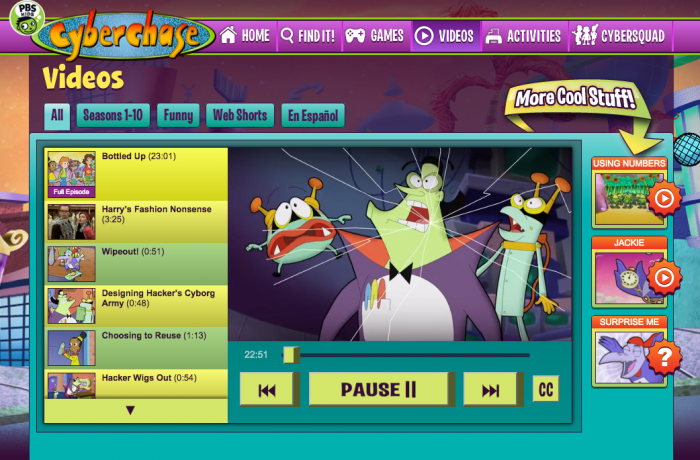 Watch Cyberchase on WSKG TV Fridays at 5:30pm and Saturday & Sunday at 10:30am. Need more math help? Check out our very own digital math series Good to Know: Common Core Concepts for Parents.